Stories of an office's most sports-averse employee winning March Madness brackets by whimsically picking based on mascot or uniform color are legendary, but the Super Bowl's most ubiquitous betting pool truly takes no skill at all. In a Super Bowl squares pool, each participant draws a slip of paper out of hat with two numbers on it, one for each team. Then you pray the last digits of an end-of-quarter score correspond to the digits you selected—a 2-5 combination for Panthers-Broncos, for instance, nets you cash if Carolina leads 22-15 at the end of any quarter. Actually, that's a trick example: if you pull a 2-5, you're screwed. Pay your entry fee and focus all your attention on snagging the cheesiest nachos or the most pepperoni-laden pizza slice because you won't win. 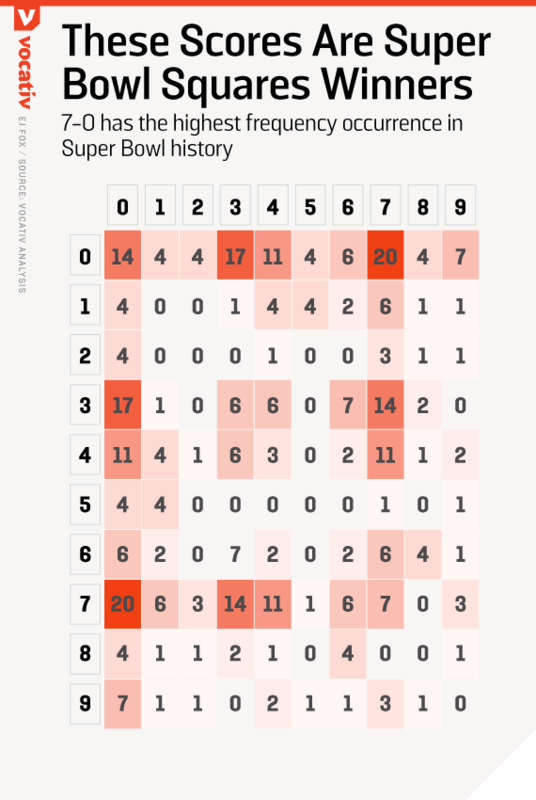 Vocativ studied the quarter-ending scores of the previous 49 Super Bowls, and 2-5 (or 5-2) was one of 15 combinations that has never happened. In fact, 2 and 5 were the least frequent digits, occurring for only 2.5 percent of all teams' quarter scores, period, never mind appearing in tandem. Rather predictably, anyone drawing combinations of 0, 7, 3, and 4 are sitting pretty. The only winning pairs to occur more than 5 percent of the time included matches of those four digits, although it should be noted that having a 0 or 7 as one half of that combination was critical. A 0-7 combo was most prevalent at 10.2 percent, followed by 0-3 (8.7 percent), 0-0 and 3-7 (both 7.1 percent), and 0-4 and 4-7 (both 5.6 percent). With extra points having been pushed back 13 yards this year and being slightly less automatic, perhaps some missed kicks or extra two-point conversion tries will lead to some funkier scores. With prizes after each quarter, multiple folks go home with money. Only twice in Super Bowl history has the same box won three times in one game: in Super Bowl V, the Colts 6/Cowboys 3 won thrice, and in Super Bowl XIX, 49ers 8/Dolphins 6 had triple winnings. But don't feel too good about that second pair, as that game accounted for three of the four all-time occurrences of 6-8. Everyone loves making the safety signal with hands clasped together (and, ideally, while humming the Safety Dance), but there have only been seven in Super Bowl history, which hurts those aspiring for two-point outcomes. So yeah, good luck and please remember that reading this piece amounts to a legal agreement to buy us something nice with your winnings. The post How To Win Super Bowl Squares appeared first on Vocativ. Regardless of who you were pulling for in this one (unless you're a Seahawks fan) this was indisputably the worst Super Bowl in recent memory. From the opening snap, it was an all-out onslaught by Seattle. Hopefully for Peyton Manning, this year's game goes a little differently. Otherwise known as the time Rex Grossman played in a Super Bowl, 2007's big game -- aside from acting as Peyton Manning's lone championship -- was mostly forgettable. The Bears logged just three points over the final three quarters, and Indy, favored by seven, covered the spread. In Jerome Bettis' final NFL game, he went out a champion. Ben Roethlisberger, in just his second season, earned his first Super Bowl ring, in a game that was relatively low-scoring -- but did include Antwaan Randle El's heroic touchdown pass to Hines Ward. The most thrilling Super Bowl of the last decade is also the most recent. Malcolm Butler's last-second interception to fend off the Seahawks' attempt at a go-ahead score will forever live in Patriots lore, as Tom Brady clinched his fourth championship.